If you managed to grab your copy last Tuesday, or one of the brilliant PS4 or Xbox One bundles recently featured here on Geek Power, then no doubt, you are as thoroughly engrossed with the final in the series of ‘Arkham ‘ games as I have been, which unlike the first two games (not counting prequel, Arkham Origins , developed by another studio) ironically opens up the ‘playground’ on the whole of Gotham City, offering you the opportunity to explore each island, and visit every nook and cranny in more detail than you would have ever experienced in any other Batman game before now. Check out that detail, and those rain effects! In his final Arkham outing, the main antagonist of the game is The Scarecrow, who arguably had some of the most memorable and creative moments in the last two games, and this time wants to infect the entire eastern board with his fear toxin. In suitably mind bending fashion, there are many WTF moments that will have you questioning the reality within the game itself, as it does thrust some weird moments on you unexpectedly, but also masterfully, many of which I can’t reveal without ‘fear’ of spoiling the story. The other antagonist and namesake of the title, the Arkham Knight remains a mystery throughout, but works together with Scarecrow as the proverbial thorn in the ‘Dark Knight’s’ backside, knowing more about him than some of his closest allies. 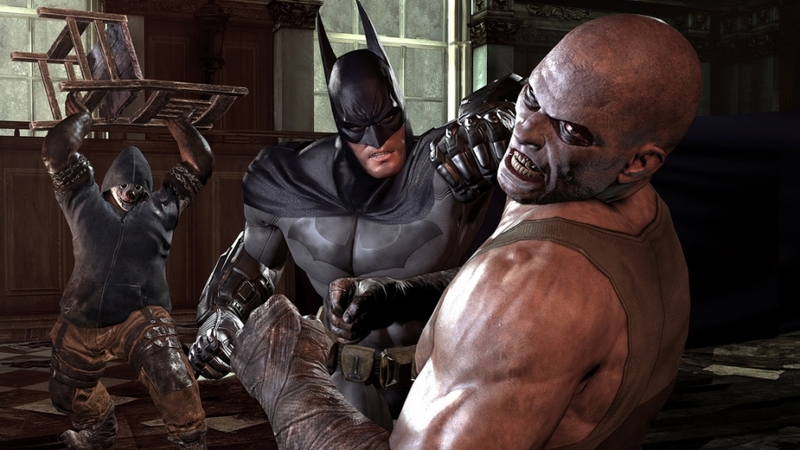 Coming in at nearly 4 years after Arkham City , and jumping head first into the next-Gen, it is plain to see that Rocksteady have gone above and beyond the previous games in the series by giving everything a fresh coat of paint, and going further to humanise the characters in this world to an even more creepier and convincing level than before, and it really shows. After the excellent introduction, the first thing that will strike you is the awesomely visceral landscape of Gotham City, which is filled with intricate detail, and accurate weather effects such as how rain splatters on Batman’s cowl and cape as you glide across the city. As you traverse the world, much like Arkham City , you are kitted out with the ability to zone in on things that happen in close vicinity, like thugs causing problems, that will allow for some diversion. Similar to Arkham City , once you’ve passed the introductory part of the game, you are presented with other curiosities and points of interest to investigate as side missions to the main story, which allows you to change your focus, discover and tackle what you want, at your own pace in true open-world fashion. You also FINALLY get to drive the Batmobile at your leisure, which not only acts as an alternative means of transport, but as an additional game mechanic, can also transform into a tank! Yes a tank! It is kind of weird to visualise Batman in an open-world with a tank considering his no-kill policy, however it does work, and Rocksteady have taken some interesting and hilariously defined steps to ensure that Batman sticks to this by reminding you throughout the story in various ways (characters lamenting the use of non-lethal rounds etc.). The addition of the Batmobile is the single biggest change that will affect the flow and pace of the game, and the fact that it can transform into a tank at will, seems to have a two-fold purpose. Since you can switch the Batmobile to a tank almost instantly, it allows you to stabilise and control the Batmobile so much quicker and easier, and is especially useful in small, tight areas. You can now drive the Batmobile, which also transforms into a freakin’ TANK! A lot of other reviews I’ve seen on the Bat-tank Batmobile has expressed it’s inclusion as an annoyance, however I personally couldn’t disagree more. When getting into tank battles with other vehicles, I find these fun, because similar to the combat mechanic, you are given an indication of when another heavy vehicle/tank is aiming and about to fire, which lets you plan your own strafe-aim-counteract, albeit at a much slower pace. But it’s so satisfying blowing up stuff in general! Having these car/tank interactions also makes the experience fresh from it’s prequels, by offering more to the sandbox that we’ve wanted in the Arkham series . You will also find the world a lot more destructible than ever before, as the Batmobile itself lets you plow through and demolish almost anything including trees, structures, statues, and some small buildings like a piece of cake. In addition to this, I generally find using the Batmobile a welcome change from the norm, as without it, the basic mechanic is still essentially the same as the previous Arkham series . Speaking of the combat, at various points in the game, you will be able to team up with other characters, and either double-team enemies, or dynamically change characters, so that you can continue your beat down of enemies using someone else, which is fun! You can also use your gadgets during your combos to greater effect, like the Batclaw to pull your enemies in ‘Scorpion‘ style for some air juggling attacks. Other additions include the ability to use enemy weapons like baseball bats, and to use the environment (walls, overhead lights, electric panels etc. ), and remote control the Batmobile for ‘assists’ (such as air juggling an enemy, and triggering a suppression round from the Batmobile). Batman’s arsenal of gadgets remains pretty much the same as Arkham City , with a couple of notable exceptions. The remote electrical charge is one of the newer ones, but you also have optional ones such as Mr Freeze’s ‘Freeze Blast’ whereby you can go through and complete the game without requiring it. Upgrades also work pretty much the same as before, except along with the suit and gadgets, you now have the option of upgrading aspects of the Batmobile, too. Capturing the magic of the previous games, Arkham Knight is a game rife with the opportunity of discovery. You are given the tools, but its up to you to apply logic and deductive reasoning when investigating clues, beat down enemies creatively, and ultimately solving puzzles, such as those set out by the Riddler (Riddler trophies are back, by the way!). All in all, I’m having a blast with the game so far, and I’m enjoying how the story is unfolding, as well as the various diversions that are cleverly introduced as you explore the world further. If you’re a fan of the series, or a Batman fan in general, you absolutely need to play this fantastic finale to the trilogy, however with 6 months of additional paid content on the horizon, if you’re looking at this with only some casual interest, it might be best to wait for the ‘Game Of The Year’ edition, which will have all the ‘season pass’ content and be considerably cheaper. Awesome review on the best console!!!!!! Get this game fools on PS4TW!!!!!!!!!!!!!!!!!!!!!!!!!!!!!!!!!!!!!!!!!!! Upgrade from XBone to PS4TW!!!! Upgrade from the PS4 to the Gameboy!!!! Upgrade from the Gameboy to the Upgrade!!! !